The Territory of Hawaii or Hawaii Territory was an organized incorporated territory of the United States that existed from August 12, 1898, until August 21, 1959, when most of its territory, excluding Palmyra Island and the Stewart Islands, was admitted to the Union as the fiftieth U.S. state, the State of Hawaii. The Hawaii Admission Act specified that the State of Hawaii would not include the distant Palmyra Island, the Midway Islands, Kingman Reef, and Johnston Atoll, which includes Johnston (or Kalama) Island and Sand Island, and the Act was silent regarding the Stewart Islands. The U.S. Congress passed the Newlands Resolution which annexed the Republic of Hawaii to the United States. Hawaii's territorial history includes a period from 1941 to 1944—during World War II—when the islands were placed under martial law. Civilian government was dissolved and a military governor was appointed. 5 Industrial boom and the "Big Five"
Upon the overthrow of Queen Liliʻuokalani in 1893, the Committee of Safety, Henry E. Cooper, Chairman (which had been started by Cooper and newspaper publisher Lorrin A. Thurston), established the Provisional Government of Hawaii to govern the islands in transition to expected annexation by the United States. Thurston actively lobbied Congress for annexation, while the former monarchy lobbied Congress to protest the overthrow and lobbied against any annexation of Hawaii. First annexation proceedings began when Democrat Grover Cleveland took office. Cleveland was an anti-imperialist and was strongly against annexation. He withdrew the annexation treaty from consideration, mounted an inquiry, and recommended the restoration of Liliʻuokalani as queen. Further investigation by Congress led to the Morgan Report, which established that the actions of U.S. troops were completely neutral, and exonerated the U.S. from any accusations of complicity with the overthrow. 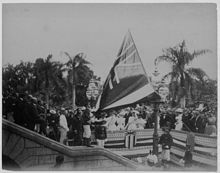 On August 12, 1898, the flag of the Republic of Hawaii over ʻIolani Palace was lowered and the United States flag raised to signify annexation. The provisional government convened a constitutional convention to establish the Republic of Hawaii. Thurston was urged to become the nation's first president but he was worried his brazen personality would damage the cause of annexation. The more conservative Sanford B. Dole, former Supreme Court Justice and friend of Queen Liliʻuokalani, was elected as the first and only president of the new regime. Hawaii's strategic location to support the Spanish–American War in the Philippines made it especially important to American interests, as argued by naval strategist Alfred Thayer Mahan. On July 4, 1898, the United States Congress passed the Newlands Resolution (named after Congressman Francis Newlands), which officially annexed Hawaii. It was signed into law by President McKinley on July 7, 1898, and came into effect on August 12, 1898. 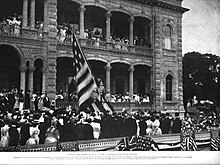 A formal ceremony was held on the steps of the formerly royal ʻIolani Palace in Honolulu where the Hawaiian flag of the Republic was lowered and the American flag of the "Stars and Stripes" raised on August 12. Former President Sanford B. Dole was appointed Hawaii's first territorial governor. Former President of the Republic of Hawaii, Sanford B. Dole was sworn in as the first territorial governor on the steps of the former royal ʻIolani Palace in Honolulu as American businessmen and plantation owners lauded victory against the previous Hawaiian monarchy. Whereas, the Government of the Republic of Hawaii having, in due form, signified its consent, in the manner provided by its constitution, to cede absolutely and without reserve to the United States of America, all rights of sovereignty of whatsoever kind in and over the Hawaiian Islands and their dependencies, and also to cede and transfer to the United States, the absolute fee and ownership of all public, Government, or Crown lands, public buildings or edifices, ports, harbors, military equipment, and all other public property of every kind and description belonging to the Government of the Hawaiian Islands, together with every right and appurtenance thereunto appertaining: Therefore, Resolved by the Senate and House of Representatives of the United States of America in Congress assembled, That said cession is accepted, ratified, and confirmed, and that the said Hawaiian Islands and their dependencies be, and they are hereby, annexed as a part of the territory of the United States and are subject to the sovereign dominion thereof, and that all and singular the property and rights hereinbefore mentioned are vested in the United States of America. The Newlands Resolution established a five-member commission to study which laws were needed in the newly organized Territory of Hawaii. The commission included: Territorial Governor Sanford B. Dole (R-Hawaii Territory), Senators Shelby M. Cullom (R-Illinois) and John T. Morgan (D-Alabama), Representative Robert R. Hitt (R-Illinois) and former Hawaii Chief Justice and later succeeding Territorial Governor Walter F. Frear (R-Hawaii Territory). The commission's final report was submitted to Congress for a debate which lasted over a year. 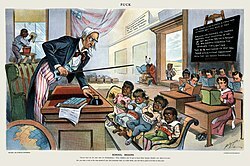 Many Congressmen and Senators raised objections that establishing an elected territorial government in Hawaii would lead to the admission of a state with a "non-white" majority in the then racist and segregated era of "Jim Crow" laws in the South at the time. The United States Congress finally agreed to grant Hawaii a popularly elected government of its own and 25th President William McKinley signed a law passed by the Congress, "An Act to Provide a Government for the Territory of Hawaii", also known as the Hawaiian Organic Act of 1900. The Organic Act established the Office of the Territorial Governor, an office appointed by the sitting American president, usually from his own political party. The territorial governor "served at the pleasure" of the President of the United States, was nominated by him and confirmed by the Senate, and could be replaced at any time. The Organic Act created a bicameral Hawaii Territorial Legislature, consisting of a lower chamber House of Representatives and the upper chamber, the Senate, with its members elected by popular vote. A Territorial Supreme Court of several justices/judges led by a Chief Justice, and additional appellate courts, also appointed by the President with the constitutional "advice and consent" of the Senate. Matson Navigation Company advertised Hawaii as a tourist destination for the first time late 1890s. Hawaii's tourism industry began in 1882 when Matson Navigation Company, founded by William Matson, began sailing vessels between San Francisco and Hawaii carrying goods. His transports encouraged him to purchase passenger steamships that would carry tourists hoping to vacation in Hawaii from the mainland United States. Matson's fleet included the SS Wilhelmina, rivaling the best passenger ships serving traditional Atlantic routes. With the boom in interest of Hawaiian vacations by America's wealthiest families in the late 1920s, Matson added the SS Mariposa, SS Monterey and SS Lurline (one of many Lurlines) to the fleet. Matson Navigation Company operated two resort hotels in Honolulu near royal grounds. The first (and for a time the only) hotel on Waikīkī was the Moana Hotel which opened in 1901. As the first hotel in Waikīkī, the Moana Hotel was nicknamed the "First Lady of Waikīkī." The hotel gained international attention in 1920 when Edward, Prince of Wales and future King Edward VIII of the United Kingdom, stayed as a guest. In 1927, the luxurious Royal Hawaiian Hotel, informally called the "Pink Palace of the Pacific," opened for business. It was the preferred Hawaii residence of President Franklin D. Roosevelt when he visited Hawaii during World War II. With annexation, the United States saw Hawaii as its most strategic military asset. McKinley and his successor U.S. President Theodore Roosevelt expanded the military presence in Hawaii and established several key bases, some still in use today. By 1906, the entire island of Oahu was being fortified at the coastlines with the construction of a "Ring of Steel," a series of gun batteries mounted on steel coastal walls. One of the few surviving batteries completed in 1911, Battery Randolph, is today the site of the U.S. Army Museum of Hawaii. Industrial boom and the "Big Five"
Theo H. Davies & Co.
As a territory of the United States, sugarcane plantations gained a new infusion of investment. By getting rid of tariffs imposed on sugarcane sent to the United States, planters had more money to spend on equipment, land and labor. Increased capital resulted in increased production. Five kingdom-era corporations benefited from annexation, becoming multi-million dollar conglomerations: Castle & Cooke, Alexander & Baldwin, C. Brewer & Co., American Factors (later Amfac), Theo H. Davies & Co. Together, the five companies dominated the Hawaiian economy as the "Big Five." James Dole, also known as the Pineapple King, arrived in Hawaii in 1899. He purchased land in Wahiawa and established the first pineapple plantation in Hawaii. Confident that canned pineapples could become a popular food export, Dole built a cannery near his first plantation in 1901. Hawaiian Pineapple Company, later renamed Dole Food Company, was born. With his profits soaring, Dole expanded and built a larger cannery in Iwilei near Honolulu Harbor in 1907. The Iwilei location made his main operations more accessible to labor. The cannery at Iwilei was in operation until 1991. Dole found himself in the midst of an economic boom industry. In response to growing pineapple demand in 1922, Dole purchased the entire island of Lanai and transformed the Hawaiian tropical low shrublands into the largest pineapple plantation in the world. For a long stretch of time, Lanai would produce 75% of the world's pineapple and become immortalized as the "Pineapple Island." By the 1930s, Hawaii became the pineapple capital of the world and pineapple production became its second largest industry. After World War II, there were a total of eight pineapple companies in Hawaii. Today pineapples are imported from Thailand and elsewhere; few are commercially grown in Hawaii. One of the most prominent challenges territorial Hawaii had to face was race relations. Intermarriage was tolerated and even sought after. Many native women married immigrant men and joined their community. By 1898, most of Hawaii's population was made up of plantation workers from China, Japan, the Philippines and Portugal. Their plantation experiences molded Hawaii to become a plantation culture. The Hawaiian Pidgin language was developed on the plantations so they all could understand each other. Buddhism and Shintoism grew to become large religions. Catholicism became Hawaii's largest Christian denomination. From 1941 to 1944, following the attack on Pearl Harbor and America's entry into World War II, Territorial Governors Joseph B. Pointdexter and Ingram M. Stainback stripped themselves of their administrative powers by declaring martial law. With the territorial constitution suspended, the legislature and supreme court were also dissolved indefinitely. Military law was enforced on all residents of Hawaii. The formation of the military government was mostly done by Maj. Gen. Thomas H. Green of the U.S Army Judge Advocate General's Corps, who became Military Attorney General. General Walter Short appointed himself military governor December 7, 1941. He assumed control of Hawaii and governed from ʻIolani Palace, which was quickly barricaded and fitted with trenches. He was relieved December 17 and charged with dereliction of duty, accused of making poor preparations in case of attack before the attack on Pearl Harbor. Under martial law, every facet of Hawaiian life was under the control of the military governor. His government fingerprinted all residents over the age of six, imposed blackouts and curfews, rationed food and gasoline, censored the news and media, censored all mail, prohibited alcohol, assigned business hours, and administered traffic and special garbage collection. The military governor's laws were called General Orders. Violations meant punishment without appeal by military tribunals. Anthony, the shadow Attorney General of the period, provides different information. The "aged and weak" Poindexter (sic), an appointed Democrat, was variously misled into surrendering his powers. Anthony does not mention fingerprinting; corroborates gasoline rationing but not food (the latter unlike the mainland); and disproves a liquor ban by showing how the military gained handsome profits by liquor permits and fees. The military government instituted employment stasis by General Order No. 91 (no leaving an employer without a letter of good standing); and the banning of courts that required witnesses and juries. Traffic violations were said to have netted prison terms and the military courts evidenced bias against civilians. There ensued a turf battle between the federal Departments of War, Justice and Interior, in which the middle one played a mediating or flip-flopping role. Indeed, it appeared War if not the Pacific Command was operating autonomously. The Glockner and Seifert cases, actually two detained, naturalized Germans, tested the military's suspension of habeas corpus. In the second year of martial law, August 1943, U.S. District Judge Metzger subpoenaed General Richardson as to why these two were held without charges. The General, according to General Order No. 31, could have had the server arrested for bringing charges against a military person, but instead had the Marshal manhandled so as to evade summons. The prisoners were released outside of Hawaii, avoiding the implicated fall of military power. The Democratic Revolution of 1954 was a nonviolent revolution consisting of general strikes, protests, and other acts of civil disobedience. The Revolution culminated in the territorial elections of 1954 where the reign of the Hawaii Republican Party in the legislature came to an abrupt end, as they were voted out of office to be replaced by members of the Democratic Party of Hawaii. During the years leading up to the ousting of the Republican Party Cold War fears brewed and the U.S. was in the middle of the Second Red Scare. The FBI employed the Smith Act toward the ILWU and Communist Party of Hawaii, arresting those who would become known as the Hawaii 7 on August 28, 1951 in synchronized raids at 6:30 that morning. They were convicted in a two-year-long trial. The Hawaii 7 were eventually released in 1958. The first Congressional bill for Hawaii statehood was proposed in 1919 by Kuhio Kalanianaole, and was based upon the argument that World War I had proved Hawaii’s loyalty. It was ignored, and proposals for Hawaii statehood were forgotten during the 1920s because the archipelago’s rulers believed that sugar planters’ interests would be better served if Hawaii remained a territory. Following the Jones-Costigan Act, another statehood bill was introduced to the House in May 1935 by Samuel Wilder King but it did not come to be voted on, largely because FDR himself strongly opposed Hawaii statehood, while “Solid South” Democrats who could not accept non-white Congressmen controlled all the committees. Hawaii consisted of 90% United States citizens, most born within the U.S.
All islands voted at least 93 percent in favor of Admission acts. Ballot (inset) and referendum results for the Admission Act of 1959. A former officer of the Honolulu Police Department, John A. Burns, was elected Hawaii’s delegate to Congress in 1956. A Democrat, Burns won without the white vote but rather with the overwhelming support of Japanese and Filipinos in Hawaii. His election proved pivotal to the statehood movement. Upon arriving in Washington, D.C., Burns began making key political maneuvers by winning over allies among Congressional leaders and state governors. Burns’ most important accomplishment was convincing Senate Majority Leader Lyndon B. Johnson (D-Texas) that Hawaii was ready to become a state, despite the continuing opposition of such Deep Southerners as James Eastland and John Sparkman. In March 1959, both houses of Congress passed the Hawaii Admission Act and U.S. President Dwight D. Eisenhower signed it into law. On June 27, 1959, a plebiscite was held asking Hawaii residents to vote on accepting the statehood bill. The plebiscite passed overwhelmingly, with 94.3% voting in favor. On August 21, church bells throughout Honolulu were rung upon the proclamation that Hawaii was finally a US state. ^ "Department of Commerce and Labor, Coast and Geodetic Survey, Terrestrial magnetism results of magnetic observations made by the coast and geodetic survey between July 1, 1905, and June 30, 1906" (PDF). ftp.ngdc.noaa.gov. p. 119. ^ "Department of Commerce, Statistical Abstract of the United States, page 1" (PDF). Retrieved 2013-02-01. ^ "An Act to Provide for the Admission of the State of Hawaii into the Union". Hawaii Nation.org. March 18, 1959. ^ Niklaus R. Schweizer, His Hawaiian Excellency: The Overthrow of the Hawaiian Monarchy and the Annexation of Hawaii (1994). ^ Christine Skwiot, The purposes of paradise: US tourism and empire in Cuba and Hawai'i (University of Pennsylvania Press, 2011). ^ Dan Cragg, Guide to military installations (U of Illinois Press, 2000). ^ Julia Flynn Siler (2012). Lost Kingdom: Hawaii's Last Queen, the Sugar Kings and America's First Imperial Adventure. p. 292. ^ Helena G. Allen, Sanford Ballard Dole: Hawaii's Only President, 1844-1926 (1988). ^ Lawrence H. Fuchs, Hawaii Pono: 'Hawaii the Excellent': An Ethnic and Political History (1961), pp 83. 110. ^ Robinson, Jennifer. "AMERICAN EXPERIENCE: Island Murder". KPBS Public Media. Retrieved 2018-11-18. ^ "The Crime That Changed the Islands". www.honolulumagazine.com. Retrieved 2018-11-18. ^ Soong, Micheline. Asian American Society : An Encyclopedia. Gale Virtual Reference Library. p. 454. ISBN 978-1-4522-8189-6. ^ Robinson, Greg. Interview Archived 2011-11-16 at the Wayback Machine about his book, A Tragedy of Democracy: Japanese Confinement in North America. CUP. n.d. Retrieved 9 March 2012. ^ Anthony, J. Garner (1955). Hawaii Under Army Rule. California: Stanford University Press. p. 198. ISBN 0-8248-0377-9. ^ Anthony, J. Garner (1955). Hawaii Under army Rule. california: Stanford University Press. p. 106. ISBN 0-8248-0377-9. ^ Anthony, J. Garner (1955). Hawaii Under Army Rule. California: Stanford University Press. p. 96. ISBN 0-8248-0377-9. ^ Anthony, J. Garner (1955). Hawaii Under Army Rule. California: Stanford University Press. pp. 65–68. ISBN 0-8248-0377-9. ^ Dan Boylan, T. Michael Holmes (2000). John A. Burns. University of Hawaii Press. p. 104. 9780824822774. ^ Michael Holmes (1994). The specter of Communism in Hawaii. University of Hawaii Press. p. 104. 9780824815509. ^ "Hawaii Votes To Petition For Statehood: Plebiscite Shows 39,413 in Favor And 19,911 Opposed". The Washington Post. Associated Press. November 7, 1940. p. 8. ^ "Democrats Win Hawaii Delegate". The Washington Post. November 8, 1956. p. A25. ^ "Commemorating 50 Years of Statehood". archive.lingle.hawaii.gov. State of Hawaii. 2009-03-18. Archived from the original on March 21, 2014. Retrieved 2014-03-21. On June 27, 1959, a plebiscite was held to allow Hawai`i residents to ratify the congressional vote for statehood. The 'yes for statehood' garnered 94.3 percent (132,773 votes) while the 'no' ballots totaled 5.7 percent (7,971 votes). Craig, Robert D. Historical dictionary of Honolulu and Hawaiʻi (Scarecrow Press, 1998). Daws, Gavan (1968). Shoal of Time: A History of the Hawaiian Islands. University of Hawaii Press. ISBN 0-8248-0324-8. Fuchs, Lawrence H. Hawaii Pono: 'Hawaii the Excellent': An Ethnic and Political History.(1961). Haley, James L. Captive Paradise: A History of Hawaii (St. Martin's Press, 2014). Kuykendall, Ralph Simpson, and Arthur Grove Day. Hawaii: a history, from Polynesian kingdom to American state (Prentice Hall, 1961). Wyndette, Olive. Islands of Destiny: A History of Hawaii (1968). Allen, Helena G. Sanford Ballard Dole: Hawaii's Only President, 1844-1926 (1988). Brown, DeSoto and Anne Ellett. Hawaii goes to war: life in Hawaii from Pearl Harbor to peace (1989). Chapin, Helen. Shaping history: The role of newspapers in Hawai'i (University of Hawaii Press, 1996). Forbes, David W. Encounters with paradise: views of Hawaii and its people, 1778-1941 (Honolulu Academy of Arts, 1992). Hawkins, Richard A. "James D. Dole and the 1932 Failure of the Hawaiian Pineapple Company," The Hawaiian Journal of History (2007) vol. 41, pp. 149–170. Jung, Moon-Kie. Reworking Race: the making of Hawaii's interracial labor movement (Columbia University Press, 2006). MacLennan, Carol A. Sovereign Sugar, Industry and Environment in Hawaii (2014). Melendy, Howard Brett, and Rhoda E.A. Hackler. Hawaii, America's Sugar Territory, 1898-1959 (Edwin Mellen Press, 1999). Melendy, Howard Brett. Walter Francis Dillingham, 1875-1963: Hawaiian Entrepreneur and Statesman (Edwin Mellen Pr, 1996). Melendy, H. Brett. "The Controversial Appointment of Lucius Eugene Pinkham, Hawaii's First Democratic Governor," Hawaiian Journal of History (1983(, Vol. 17, pp 185–208. Poblete, JoAnne. Islanders in the Empire: Filipino and Puerto Rican Laborers in Hawai‘i (University of Illinois Press, 2014). Sumida, Stephen H. And the View from the Shore: Literary Traditions of Hawai'i (University of Washington Press, 2015). Williams, Jr., Ronald. "Race, Power, and the Dilemma of Democracy: Hawaii's First Territorial Legislature, 1901." Hawaiian Journal of History (2015) 49#1 pp 1–45. Whitehead, John S. Completing the Union: Alaska, Hawai`i, and the Battle for Statehood (2004). Congressional Debates On Hawaiian Organic Act ... Matters Concerning the Hawaiian Islands in the 56th Congress, First Session, December 4, 1899 – June 7, 1900. Photostatic Reproductions from the Congressional Record, Vol. 33, Parts 1–8. 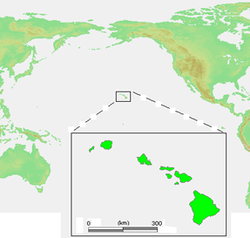 Wikimedia Commons has media related to Territory of Hawaii. This page was last edited on 13 February 2019, at 23:58 (UTC).